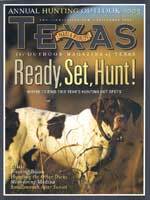 TPWD works with landowners to provide low-cost, high-quality hunting opportunities. Great dove hunting opportunities are available on private land tracts leased by Texas Parks and Wildlife Department. The Public Hunting Short Term Public Lease Program was started in 1994 with only 10 hunting units. Now, 143 hunting units totaling 59,027 acres are located in 47 counties distributed from South Texas (Brooks County) to the Panhandle (Hansford County) and from Beaumont (Orange County) to far West Texas (Hudspeth County). Many of the leases are located between San Antonio, Dallas and Houston, within an hour's drive from a major population center. "We are still basically trying to go with the same area," says Vickie Fite, public hunting coordinator. "If you were to draw it out on a map, from Dallas to Houston, over to San Antonio, up to Dallas, it would resemble a triangle. We have quite a bit of property over in Northeast Texas also. It's a little farther removed from I-35, but it's close to the Dallas area." All a hunter needs is the Annual Public Hunting Permit, in addition to a hunting license and migratory game bird stamp. After purchasing the $48 permit, the hunter receives a book containing maps giving directions and locations of each dove hunting lease. Lease sizes range anywhere from 25 to 400 acres. Dove hunters can come and go as they please. There are no check-in requirements. Most of the properties have crossovers on the fences that facilitate access and many provide access for hunters with disabilities. "It's hard to find public land to hunt on in Texas," says Linda Campbell, program director for private lands and public hunting. "First of all there is very little public land. I think we have about 6 percent public land and that includes highway rights of way and everything else. For a hunter that does not have a private lease, it's very difficult to find a place. We are very interested in making sure that public land hunters have a place to hunt. One way we can do that in a state that is very much private land is to work with private landowners so that they can provide access for public land hunters." TPWD pays landowners anywhere from $2 to $6 per acre depending on the quality of the habitat and proximity to population centers. "When we get an interested landowner, we check out the land and check out the landowner. We have certain requirements. We want them to provide an attractant. We want them to provide easy access for the hunter." The landowner makes money on land that otherwise may have lain dormant, and hunters get a low-cost, high-quality locale in which to pursue their quarry. Check the TPWD Web site at <www.tpwd.state.tx.us/huntwild/hunt/public/> for more information.